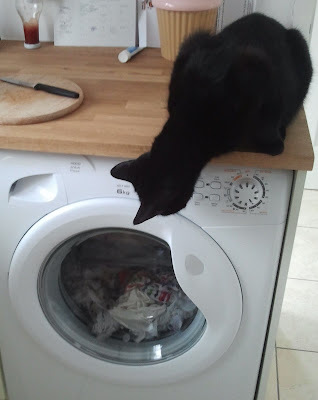 Boo happened to be sitting next to me when I started up the new washing machine the other day. I don't know why he was surprised by it, he's seen and heard one before. But for some reason, on this occasion, it required a closer look. From the work top he's not allowed on! Right now, Boo is not talking to me. And I am not talking to Boo. Having found a number of lifeless gifts by the front and back doors at the other house, I had a suspicion that he may be a hunter. And he may be an efficient hunter. Today, however, my suspicions have been confirmed. A few hours ago, I discovered him in the garden, with the spoils of his labour. After a short, heated, debate and tussle, and much to Boo's disgust, I managed to separate him and the bird. Perhaps I should have just let him do what nature intended. As, while I was trying to save the first victim, he went back to claim another. My garden shed is now a bird hospital and Boo is grounded! Don't work with children or animals, Folks! Oh dear... my cat's getting on a bit now and can't be bothered with hunting anymore, and he generally left it to his (dear departed) sister anyway. He was only trying to bring you a prezzie to say thankyou for not leaving him behind at the old house.!!!! Muver. Can you add Husbands to your list of 'Do NOT work with...'? Fab story - I love a cat with character. Just be grateful the presents stop outside. Femo delights in taking them in, but she's a humane hunter so they shoot off to where ever only to be found later still alive! Does this mean you are up early to catch the worms to feed your patients! LOL ! Are you two on speeking terms ? Hi Faye, your Boo looks like a very intelligent little chap! Our Oscar is also a nifty hunter now (he wasn't when we first moved up here - he has 'improved' loads!) and quite regularly brings us gifts, normally without their heads but sometimes alive. I absolutely hate mice / rats - really, really, really can't stand them they freak me out. Have been known to jump on a chair or other high object ( kitchen sides are a good one!) and scream until they are taken away! He also quite happily will hunt birds, it's the one thing I don't like about cats. One of our now departed ladies even decided that snakes were a good thing to bring home, luckily I was at work at the time and hubby dealt with it! PS - My stash diet is getting harder to stick too! Free postage, eh - will have to go take a look see! I know what you mean my little Winston always leaves me presents but some consumes them if I show that I'm not impressed! It's supposed to be a sign that he loves you and its way of saying thanks for loving and looking after me - nice eh - how lucky we are! Qu'est-ce une belle carte - J'aime cette image Mo Manning elle est tellement mignonne. Merci pour être passés et me laissant un commentaire. Soyez de nouveau à vous voir bientôt. I think I'm going to have to get the mini beasts to have a serious chat with Boo about unwanted gifts soon eh? Fabulous photo, Fluff! Boo looks so cute with his neck stretched out peeking into the washing machine. And do I spy some frilly knickers going round and round? And some ointment on the counter top? Having problems? A picture tells a story, huh? He's just letting you know he loves you, little weirdo that he is! Tickle likes to bring me 'presents' too. is that a giant cupcake I spy behind Boo? is it filled with smaller cupcakes?